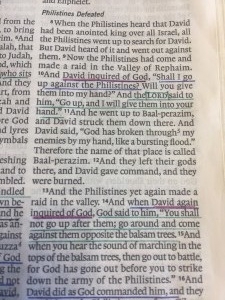 Yesterday’s reading found me contemplating David’s life and leadership in 1 Chronicles 13-14. David’s dependence caught my attention. He showed dependence on others as he consulted with leaders of thousands and hundreds (1 Chronicles 13:1-4) regarding the ark. The words “all, us, our, and we” are repeated 11 times in four verses. Pretty significant, I’d say. As I think about David, a man after God’s own heart, I am sobered knowing of his eventual choices of adultery and murder. I wonder how his life might have looked differently had he continued in dependence and connection with others and a posture of dependence on God through inquiring of Him before taking action. evaluating how I am doing in the area of dependence on others. Do I consult others when making important decisions? evaluating how I am doing in the area of dependence on God. Do I inquire of God before making decisions and taking action?